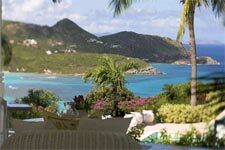 March, 2008 - I was sitting on the terrace of the late Liz Claiborne's palatial home on St. Bart's, listening to Edith Piaf and watching the waves roll into the exquisite St. Jean Bay. I felt as fortunate as the fashion icon herself and sense her presence and impeccable taste everywhere. I was never lucky enough to meet the legendary designer – Ms. Claiborne was a pioneering American entrepreneur, the first woman in the Fortune 500, as well as an exceedingly generous philanthropist – yet I was a guest in her home all the same. Such is the alchemy of renting a villa, Wimco's Villa VGM, in this particular case. "You get to dream with a villa," said Renaud Rippert of the enchanting process, "you get to put on the lifestyle of someone else." A transplanted Parisian who adores America, Rippert works as a sales agent for Sibarth, a St. Bart's partner of Wimco, one of the world's top purveyors of private villas-for-hire. What Rippert says is spot-on; one great charm of this type of vacation is the sense of stepping into a local's existence – and discovering a destination in a way you never would otherwise. You get to go to the local boulangerie on St. Bart's and get your Paris-worthy morning croissants from the same baker year after year. In Tuscany, you wake up surrounded by the vineyards that create the Chianti you'll drink with dinner that evening. You, and your family and friends, gain an unparalleled sense of place. Villas were once the exclusive perk of being exceedingly wealthy or famous (usually both) or having an ancestral family home in Provence. But increasingly, vacationing in a villa – a luxury home, usually with a staff, its own kitchen, and plenty of space for relaxing, either a private dwelling or a house on the property of a hotel or resort – is gaining popularity in leaps and bounds. The Europeans popularized this style of getaway long ago, but Americans are now fueling the fire, especially in the Caribbean. Michel Neutelings, chief operating officer of Amanyara Villas in the Turks and Caicos, is thrilled by the growth of this type of escape. "I have been behind the villa trend for many, many years, and in the past 10 to 12 years, it's grown explosively. People's time off is very precious. We get CEO's, celebrities – people who want no hassles, they just want to come down and instantly relax." The quick down-shift into relaxation mode is another distinct advantage to renting your own place – if you want to pop open a bottle of bubbly and go skinny-dipping as soon as you walk in the door of your villa, who's to stop you? Doing what you want, exactly when you want to, in utter privacy – that's the definition of privilege, and it's growing in demand. A recent poll of American Express Platinum Travel Service specialists shows that the number of Americans requesting a villa getaway is at an all-time, and Italy, France, and the Caribbean (St. Bart's particularly) are the most desirable destinations for villa vacationers. In addition to the tranquility he adores, Bacon is quick to name his second -favorite reason for renting a villa: "Convenience. We have our own breakfast at the villa, lunch we get to-go, and then dine out for dinner at a different restaurant every night. We sometimes hire a chef to come in and cook for us, which is wonderful. We take the same four-mile walk along the beach every morning – it's beautiful." Longtime fans like Bacon know that the cachet of a villa has nothing to do with ostentation and glitz, and everything to do with making life as simple and unencumbered as possible, preferably in an exquisite locale. And as Nussbaum points out, it's profoundly relaxing to be able to work with no one's schedule but your own. "The great thing is having at-home-like amenities – and you can have casual meals whenever it suits you," he says. "Perhaps you'll go out to dinner every night, but you don't want to have to schedule 21 meals for a week – that's not relaxing." Departing from Liz Claiborne's villa (Wimco's villa SIB VGM) in St Barts was bittersweet. Who knew if I would again live in such understated elegance, feel such a sense of place and a connection to the people around me? I knew. It wouldn't be long. I was already plotting out the next villa vacation in my mind. 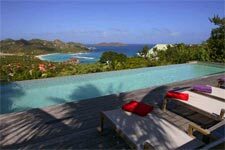 Wimco Note: During her trip to St Barts, this writer also spent one night at villa SIB LLA. Uniquely positioned on the crest of a ridge, villa SIB LLA (Villa Lakshmi) opens on two spectacular and unobstructed vistas of the island. To the west a panoramic view over the emerald green waters of St Jean Bay, to the east a stunning landscape of the rural and mountainous Saline valley with it's deep turquoise waters.